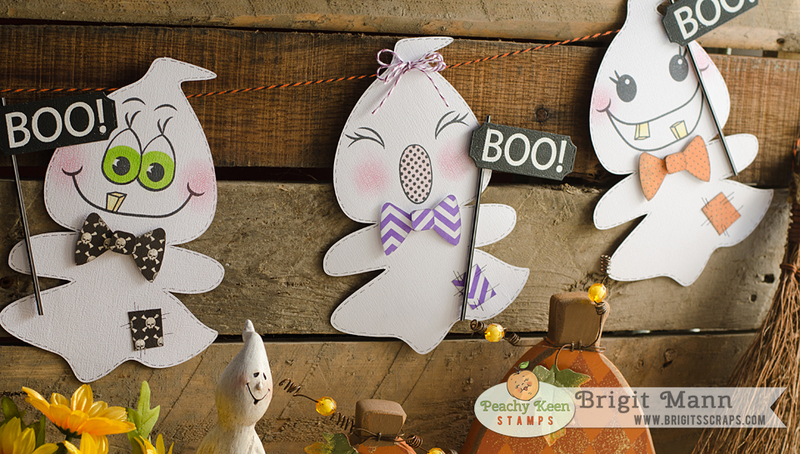 Brrrr... Peachy Keen Stamps October Specials!! 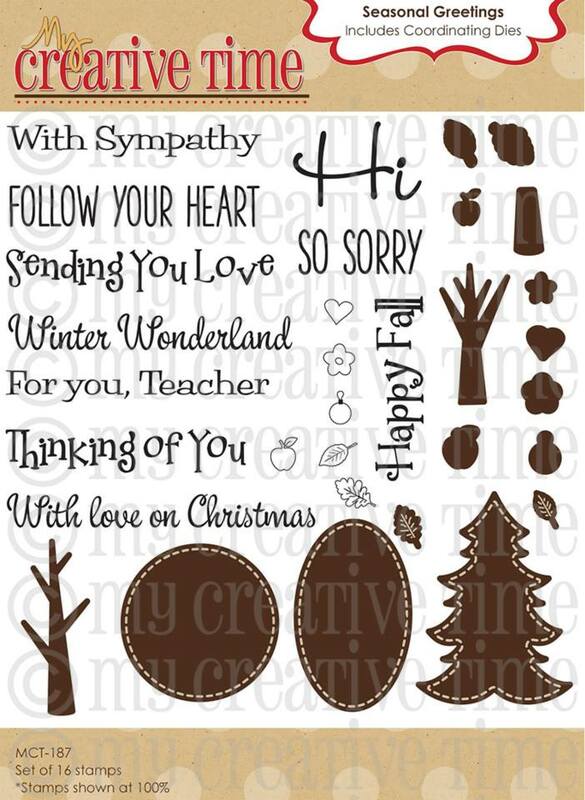 Peachy Keen Stamps has some great Specials this month. All the dies are from Jaded Blossom and I used some Trendy Twine. MCT 37th Release October Blog Hop!! Today is My Creative Time's Blog Hop! I'm so excited to share with you today this wonderful release. It's been a fun week with all the sneak peeks, I really enjoyed working with these stamps and dies. Thanks so much Emma and the rest of the Design Team for letting me join you with this Release! Also a big THANK YOU to all the MCT fans, you have been so awesome with all your wonderful comments!! 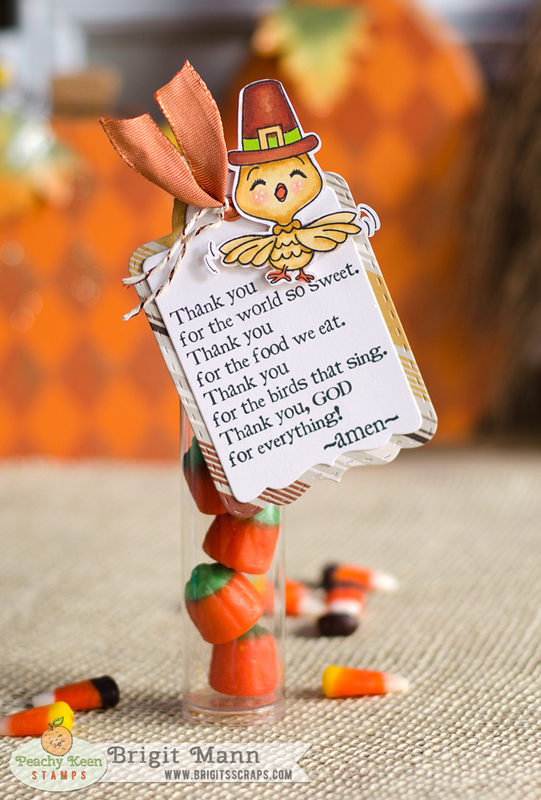 Placecard treat holder that holds a hershey nugget for an after dinner treat. These are so quick and easy to make, I used 3 of the Stitched Round Tag, Arrow and Tag die to form the holder. Trim off the top of one of the tags so it measures 2" then score at 1/2" and 1 1/2", this is for the bottom. Glue one tag to the 1/2" flap in the front and one on the back, one nugget fits perfectly inside. The oval is from the new set Seasonal Greetings, sentiments are from the Boughs of Holly set and the mitten is from the Winter Cheer set. 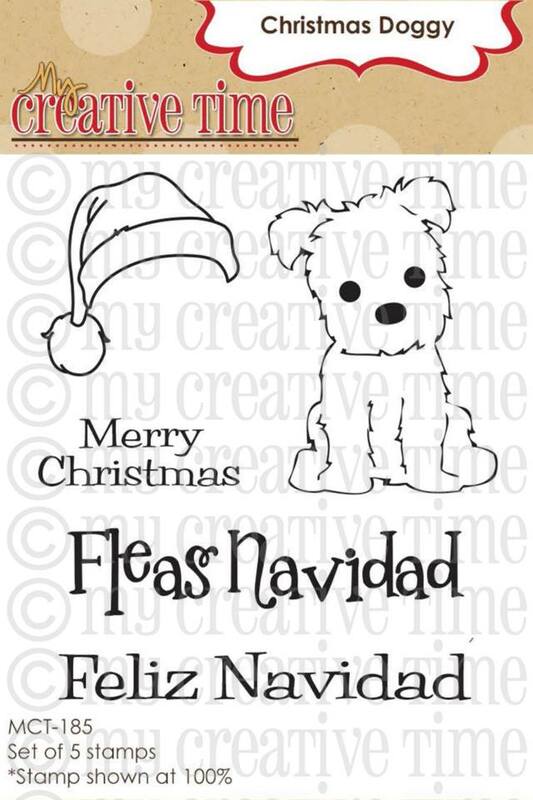 For our "Freebie" stamp for this release, we are giving away this ADORABLE stamp set "Christmas Doggy" to the FIRST 150 shoppers! YEP, you heard that right, this stamp will go to the FIRST 150 shoppers for FREE! You do NOT have to add it in your cart, Emma & her shipping crew will automatically include it in your pkg, ONLY to the first 150 shoppers! IF you happen to come through AFTER the 150th shopper, no worries because this stamp will be available for sale! Emma, knows there will be questions on whether YOU made the first 150? AFTER the 150 shoppers come through, then you will see this set available for PURCHASE along w/the new release items! ALSO, DON'T FORGET our sale starts RIGHT NOW! 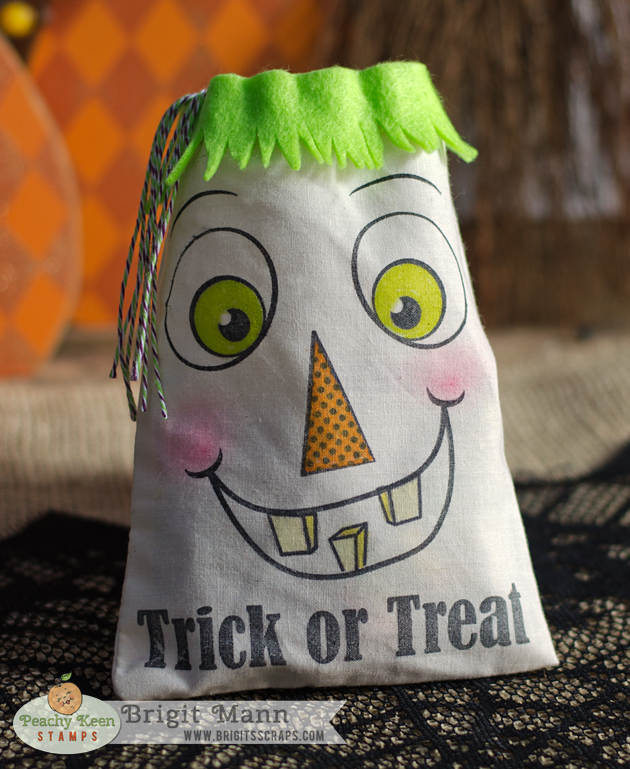 Use the code: OCT2014 to receive 20% off your entire purchase! This sale applies to "IN-STOCK" items ONLY. This sale will end on Friday, October 31, 2014 @midnight PST. It's Day 4 of My Creative Time's October Release! Tomorrow the sale starts along with the Hop so don't miss it! I have two Sneak Peeks for you today! 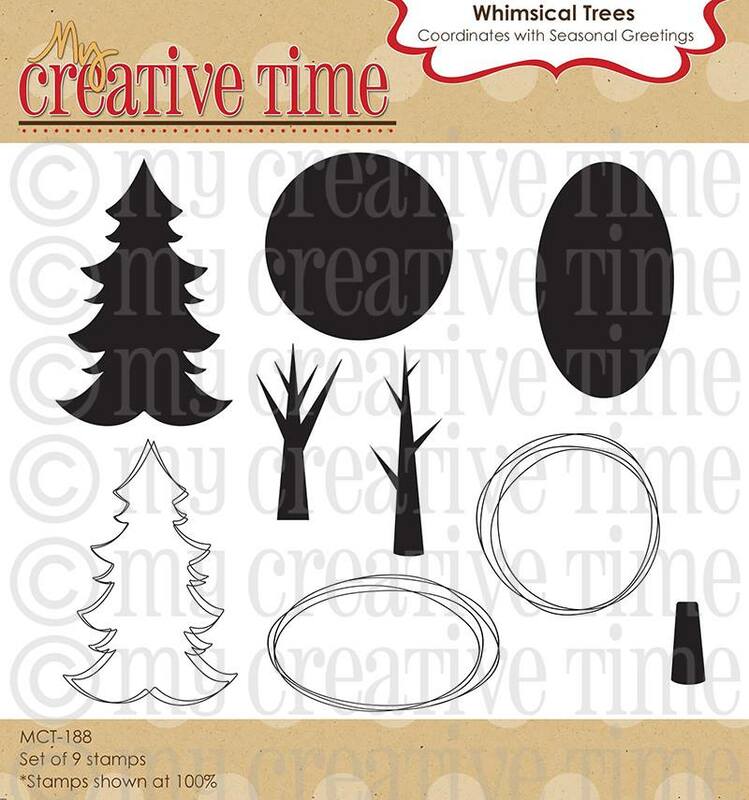 I also used two other new sets that was released this week, Whimsical Trees and Seasonal Greetings. The gold striped background was cut using the Stitched 4 x 6 Journal Die, I just trimmed 3/4" off, the Stitched Bracket Dies covers up the top and bottom so you don't see the missing stitching. The circle and frame was created using the Bunch of Fun Circle Dies, totally love this set, a must have!! 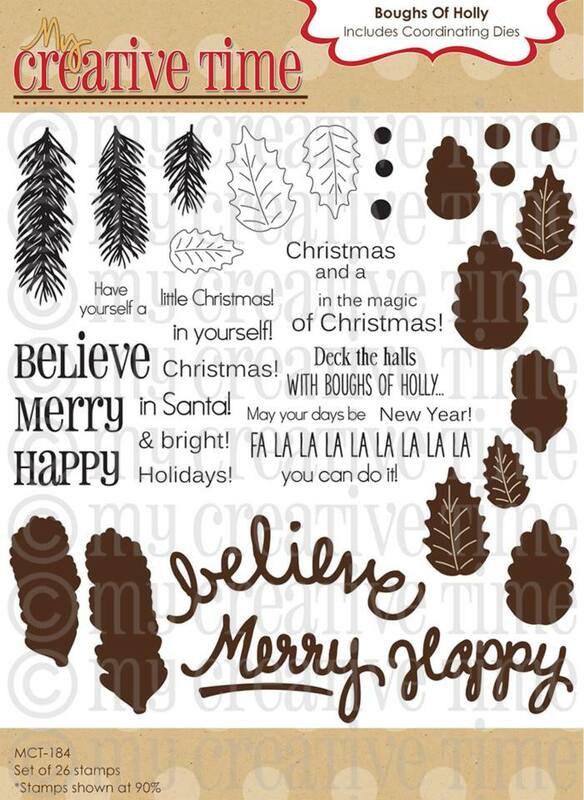 The tag is from the Just Tags Stamp and Die set and the Holly and berries from the new Boughs of Holly. 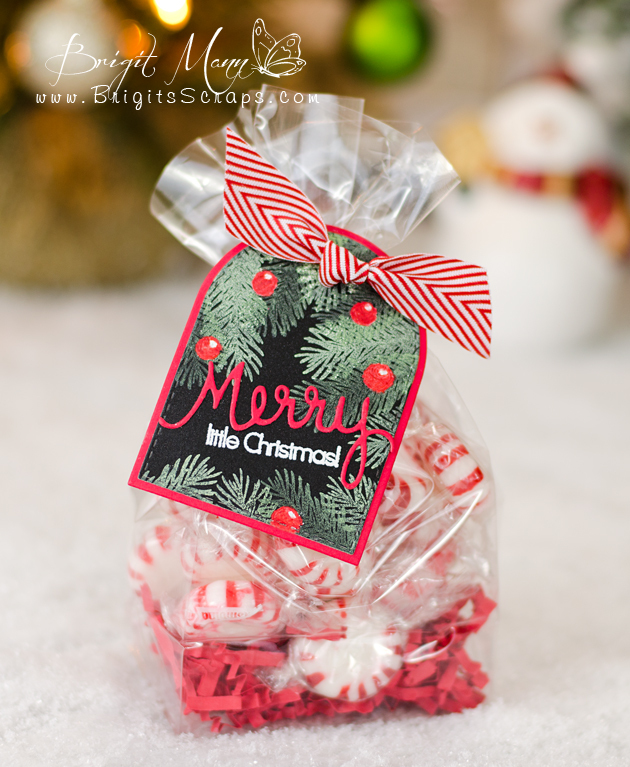 I used some Versamark and stamped the little doggy around the bag, perfect for some special Christmas treats! Click here to check out what the Design Team created using these sets. It's Day 3 of My Creative Time's October Release. 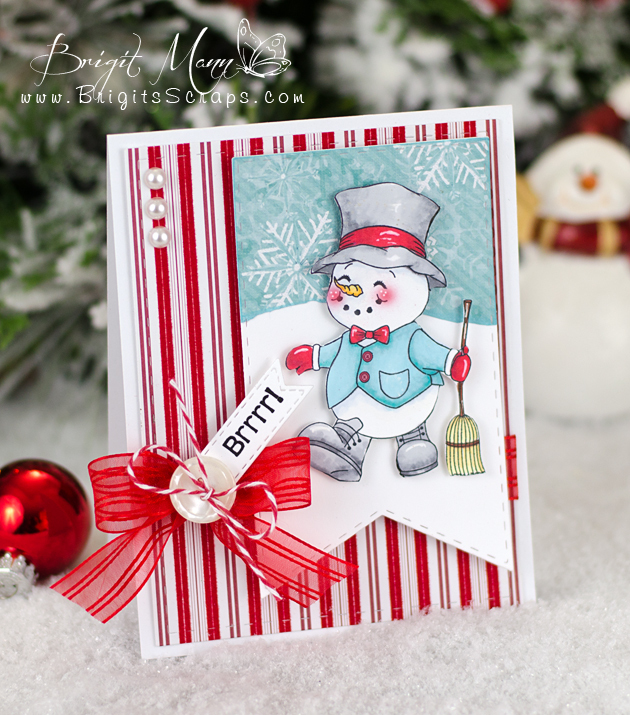 I have another Sneak Peek to share using the new set Winter Cheer!! 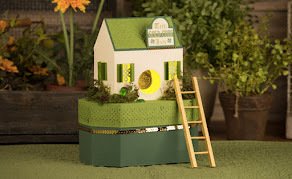 This set it so adorable, you're going to love the cute sentiments and dies! 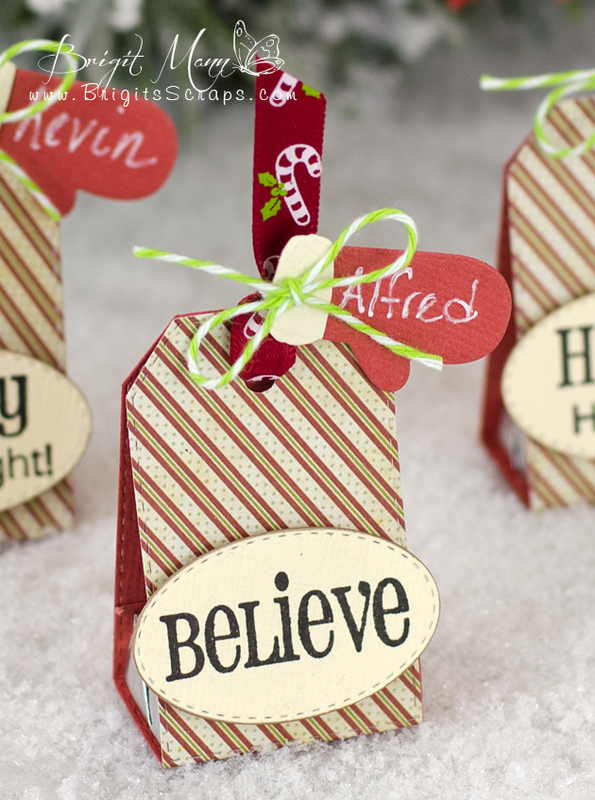 I love making tags for Christmas and this Release is totally perfect for them! The base is the Stitched Doily Die, I use this die on a banner I made for my son's wedding, I really love it. 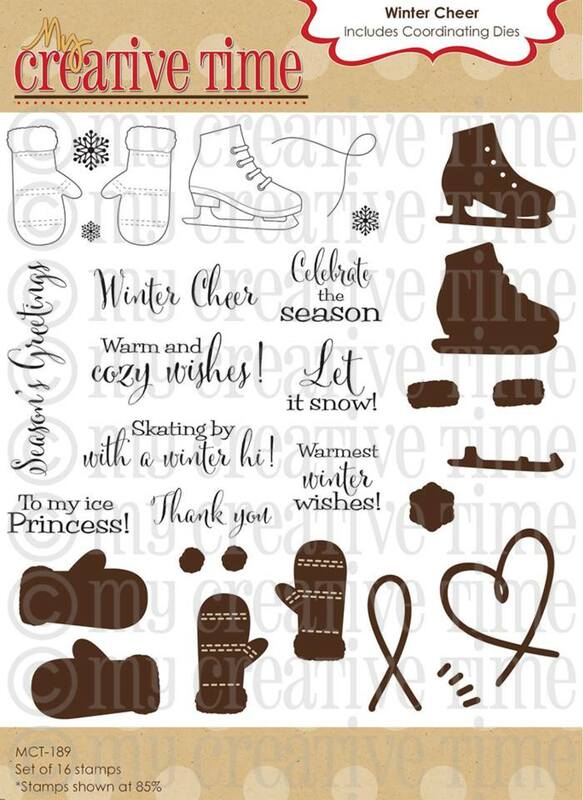 The little skates and sentiment is from the new Winter Cheer set, aren't they so cute!! The Holly and berries are from the new set Boughs of Holly and the frame was created using two circles from the Bunch of Fun Circles Dies. I should have used pattern paper for the skates, next time for sure!! Click Here to see what the Design Team created using this set!! Hi Everyone!! 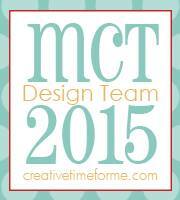 I'm so happy to be the Guest Designer for My Creative Time this month!! 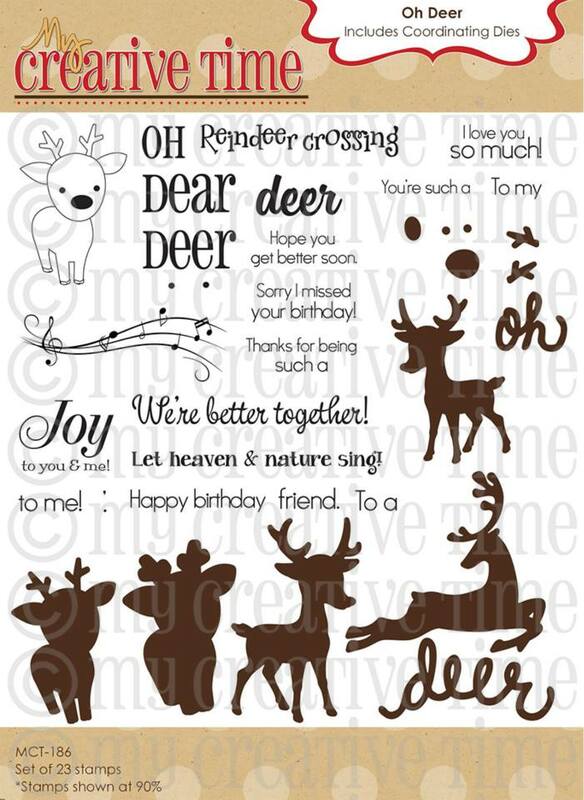 I love all of Emma's Stamps and Dies and this release is totally awesome!! 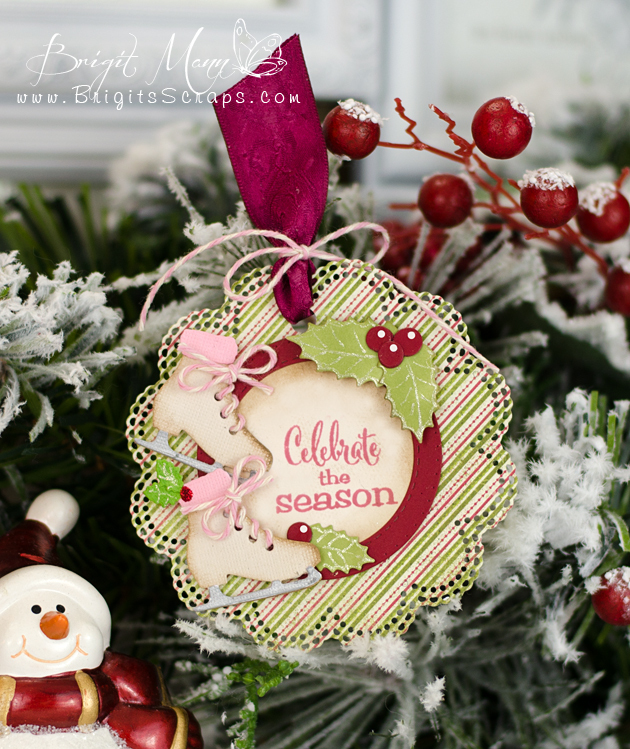 I use the new stamp set and coordinating dies Boughs of Holly, the tag is from the Just Tags Stamp Set. To make it look more dimensional I stamped and embossed only a couple of the pines first, then just stamped over the embossed ones. For the berries I stamped and embossed with white ink and powder and then colored them in with a red promarker. Click here to see all the awesome projects the Design Team created using this set! One of two Projects I made for Carta Bella that made it into the Scrapbook Generation's Create Magazine's October Issue!! 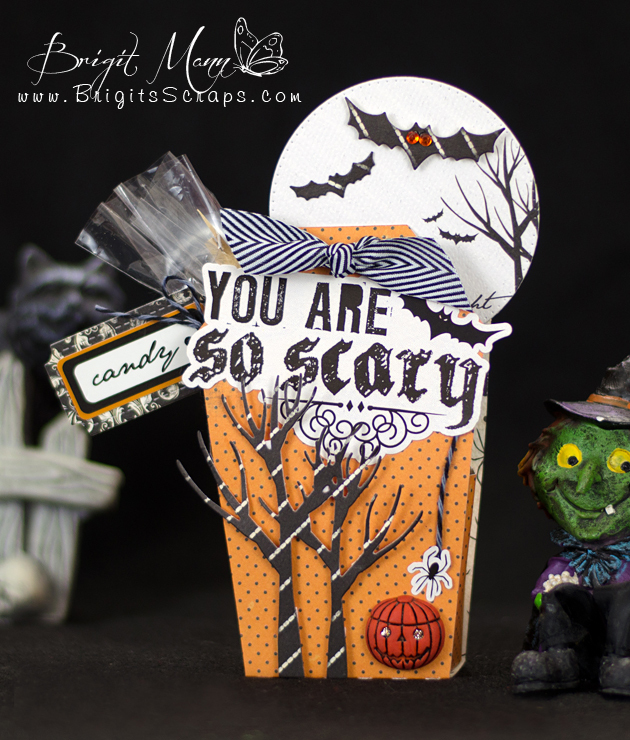 The paper, elements and dies are all from CB Spooky Collection. Coffin Treat Box is from Lori Whitlock's shop. Hi everyone, Peachy Keen Stamps October Challenge 14-14 started yesterday. PK-141 Lil' Tweets, how cute is this lil' turkey!! The tag is Jaded Blossom's Treat Tag Die and the candy tube is also from JB. 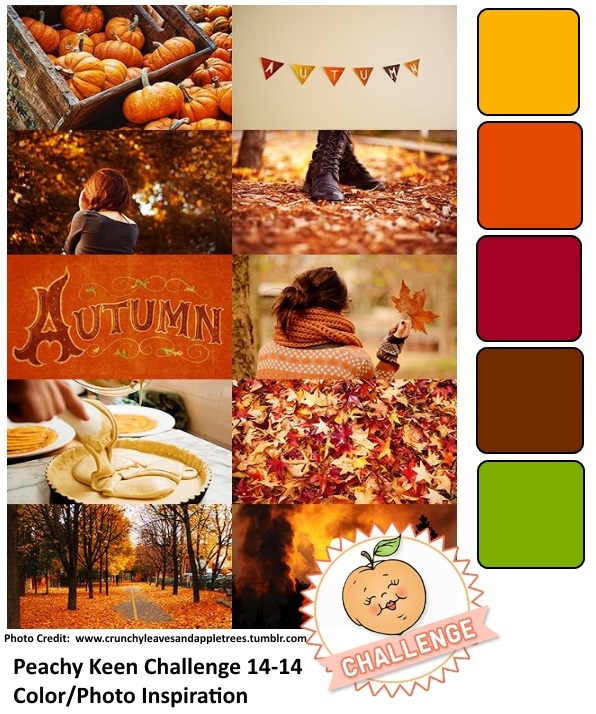 Here's the Photo Inspiration for the Challenge, have fun!! 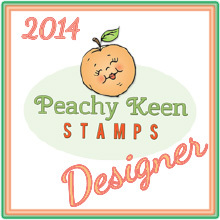 Peachy Keen Stamps October 2014 Release and Reveal Facebook Hop!! Peachy Keen Stamps﻿ Oct Release!! The NEW FACE STAMPS and SVGs are available for purchase at the PKS, http://www.peachykeenstamps.com/shop now. 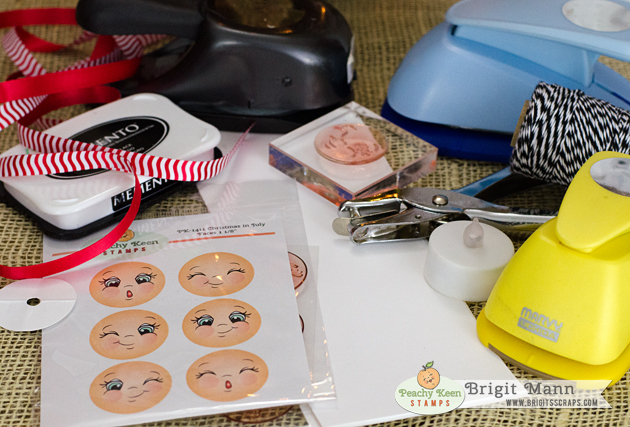 I created two projects using these adorable face parts!! You're going to love how you can mix and match the face parts! For both of these projects I used the PK-1433 Fall Face Parts Large. These fit perfectly on the 5" x 7" muslin bag above and they're great for creating a nice size banner!! There's some great PRIZES for 3 lucky winners!!! #1 Winner - All stamps being released. 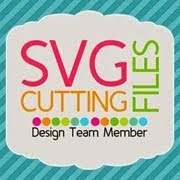 #2 Winner - All SVGs being released. #3 Winner - 1 Hand Crafted item created by Kathy Jakopovich! So hop on over to GiGi's Facebook page to join in the fun! 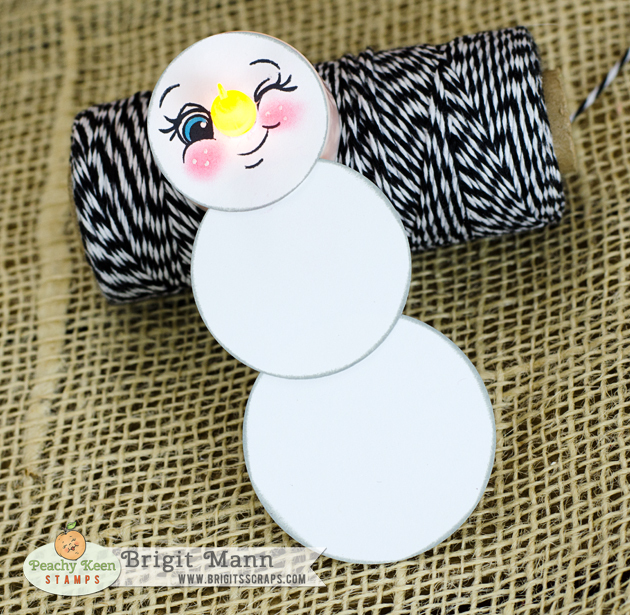 PK-1412 Snow Hugs Snowman sets. This adorable tealight ornament makes such a cute gift for family and friends or even Christmas gifts for Teachers. 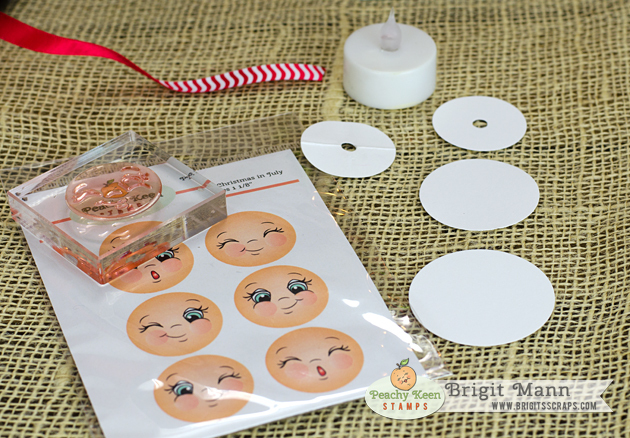 You can make a bunch in no time at all with just a few craft supplies that most of you have already and some adorable Peachy Keen Face Stamps! Punches 1 1/2", 1 3/4" and 2". I punch a 1 1/2" circle and folded in quarters and use the 1/4" to punch a hole directly in the center, I use this one as my template, it helps when you're making a bunch at a time. Punch your three circles using the different size punches. 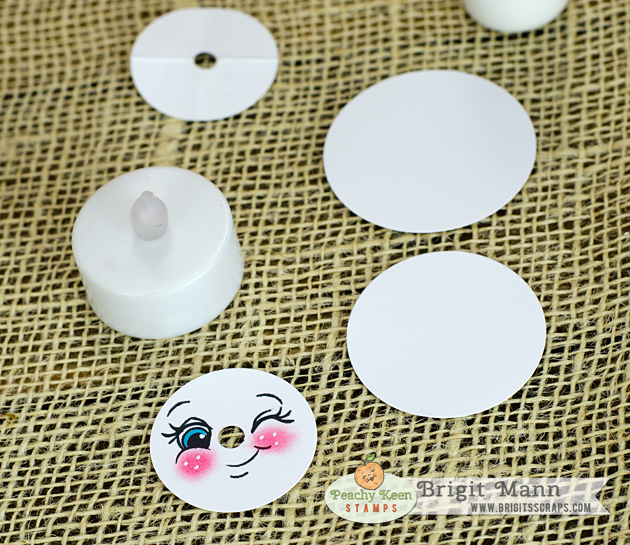 Now use your template to punch a 1/4" hole in the 1 1/2" circle. Stamp your face image onto that circle lining the nose up in the center hole. Chalk the cheeks and ink the edges before putting the face on the tealight. Gently push the face over the tealight, it's tight so go slow, will expand a little. 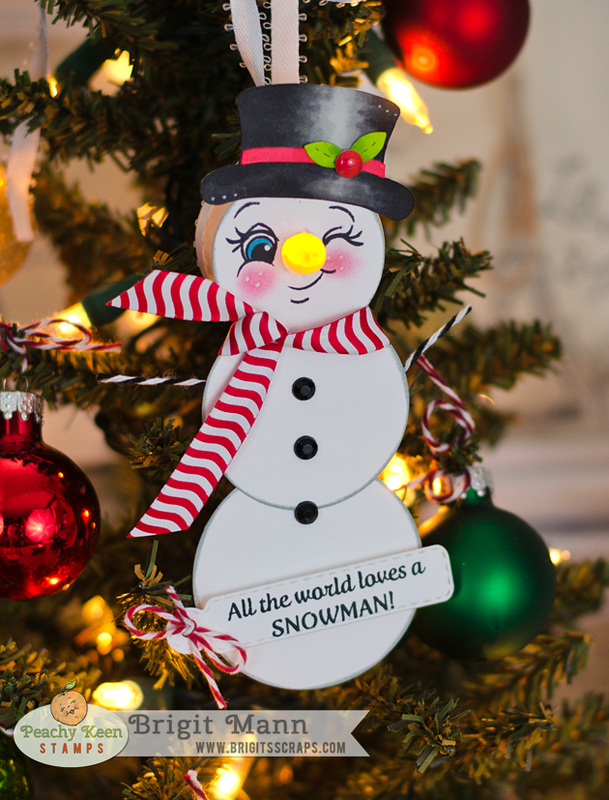 Glue the snowman together and decorate, I added a top hat that I cut with my silhouette. Some ribbon as the scarf and black gems for buttons. Tie a piece of ribbon around the tealight so it can be hung. 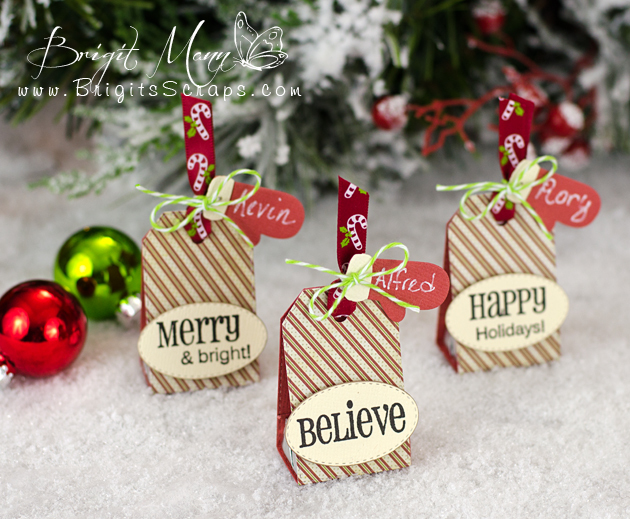 I hope you've enjoyed this tutorial and get to make some of these ornaments!